138 - Are We Alone? If we are to believe what the church and the mass media are telling us, there is still no evidence for life outside Earth. But what if we are not being told the truth? How would you feel if you discover there is an on-going policy to deny everything that would disturb the status quo of the church and our coöperating governments? There are hundreds of Cockpit Voice Recordings (CVR's) where trained pilots report seeing aircraft or spacecraft, pilots who report near misses in the air with Unidetified Flying Objects. Yet none of these incidents find their way into the news. Dozens of astronauts reported seeing "Bogeys" from their capsules or space-shuttles, one of the astronauts clearly states "We have the Alien Spacecraft under observation." When you put all the evidence together it becomes clear there is something going on, our leaders want to hide from us. We are deliberately being withheld certain kind of information. This information however is crucial in understanding our past, and possibly for the future of the human species. (If we have any furure as a species.) Never forget that our "creators" or "gods" wiped us out, at least once, before. So make up your own mind, and do not trust the newsmedia to tell you what is going on! 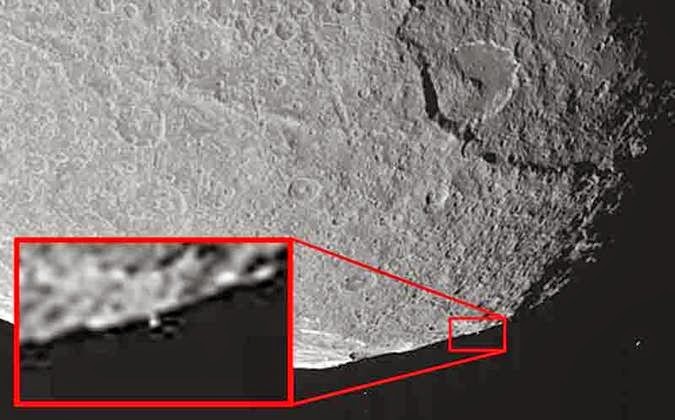 Below are some photos of Iapetus, a moon of Saturn. 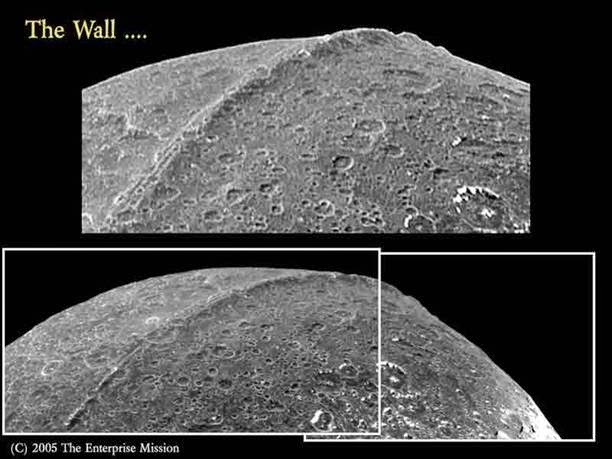 It has a 20 kilometer high wall running round the moon. And at the bottom you can see a tower. Nature doesn't make towers!